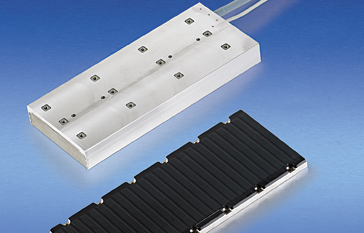 The 3-phase synchronous Linear Servomotors AL2800 expand the high-performance product range. The coil unit contains a grooved, laminated core with inlaid copper windings. It is generally used as the moving part. The magnet plate contains the steel plate to which the permanent magnets are fixed. The AL2800 series consists of four different motors, all having exactly the same width of 130 mm. This means that all the motors can be operated using the same magnet plates. There are two different lengths of magnet plates that can be combined in any desired way. The magnet plates are fully sealed and therefore have an almost perfectly level and robust surface. The coil units are also potted, satisfy protection class IP 64, and are therefore suitable for use in aggressive environments. Coil units are fitted with a 0.5 m cable bundle and optionally with pre-assembled connectors, so that they can be connected to the connector box or the Servo Drive via plugged connections. This greatly reduces the difficulty of implementing the cabling and makes a significant contribution to avoiding errors. All linear motors of the series AL2xxx have the same magnet pitch (24 mm). The motor connection is compatible with the other types of the AL2xxx series.